Discussion in 'MacBook Pro' started by SvK, Mar 4, 2013. Im a composer / musician who scores music for films. I need a lot of horsepower and very fast reads from SSDs, due to mammoth sample-libraries for my Orchestral music. I owned a 2010 4 core Mac Pro Tower with 32 gig of RAM and 5 internal 128gig SSD's hooked up to 3 displays. CPU wise, that is a little under-powered and it is generally agreed that for Music , the 6-core is the sweet spot for professional music production. Well....the rMBP is just under the 6-core speed according to Geekbench. So ...i bought it. With 16gig ofRAM and the 768 gig SSD (read speeds are just about 500) . I also bought a 27 inch Thunderbolt display. IT PLAYED!! ...my CPU meters in Logic Audio barely blinked, and that super fast internal SSD inside the rMBP streamed all my strings, brass, woodwinds like a champ! At the end of the day, I wanted to chill out on the couch and continue editing my recording session...just unhooked 2 cables....and ALL that power came with me to the couch. To keep things safe, I have a time-capsule that backs up wireless, when im disconnected from the big rig and over ethernet ( the 27 TB display has ethernet ) when hooked up to big rig. absolutely amazing. That rMBP is running a 27 inch, a 1080 hdmi tv and its own display and audio in/out is powered by the UAD Apollo TB audio interface. and I've got 6-core MACpro power in a friggin laptop. Embrace the future, it's here. Sadly we have reached a point where the MacBook Pro is almost as fast as the Mac Pro. This is why we need a refresh. I barely touch my Mac Pro these days. Having to transfer files over to the Mac Pro is just a hassle when I can do everything directly on the MacBook Pro; and if I need more monitors, I can hook them up. Finally just picked up a Promise Pegasus J4 to store my media, and that's fast and more efficient for my needs than dealing with the slow HDDs in my desktop. Just a year ago, I would have never imagined let alone argued that the MacBook Pro is a Mac Pro replacement. Today I can say for sure that my rMBP is more than enough for my needs and I think I'm ready to get rid of the Mac Pro. And another person who clearly wanted and needed the power of the rMBP... that got exactly what they want, and more. Congratulations on the purchase, and on your satisfaction. c'mon dude! just buy another one 15" retina and live the first one hooked up! Which tells me you never needed a MacPro to begin with. 16gig ram is the minimum spec for me. That was not available in laptops 2 years ago. I debated between the Mac Pro and the Macbook Pro and I too chose the 15" RetinaPro last week. Clearly the OP didn't need a Mac Pro with 3 year old specs when their rMBP with the latest tech is sufficient. See I don't agree... I found it a bit boring and without substance. My boy Tony is big in the Acapella scene (producing, founder Urban Method) and rocks a MBP, not sure if he has a Mac too or not. So it could be done even 2 years ago. The last time I updated my Garmin Zumo European maps, I had a Sony Viao. After I'd downloaded the maps, I hit install. It took 6 hours to prepare the maps, and a further 5 hours to install them. Last night, my rMBP took 10 minutes to prepare the maps, and 10 minutes to install them. If you bought the Mac Pro because you needed 6, 8 or 12 cores, the 2009 model is still almost twice as fast as the rMBP at tasks that can take advantage of it. Okay, so the OP has an application that requires very fast disk access and loads of memory. And you come up with a 3D benchmark. What is the connection ? He doesn't need any kind of 3D or GPU offloading ! Clearly another case where it would help to read first, write later. If you need other aspects of the Mac Pro then no macbook will ever be a replacement. However, it is a limited (and shrinking) market. The number of tasks that demand a mac pro that aren't better run on a server or server cluster these days is fairly tiny and shrinking. The point is there are workloads the rMBP in which is not a replacement for the Mac Pro. 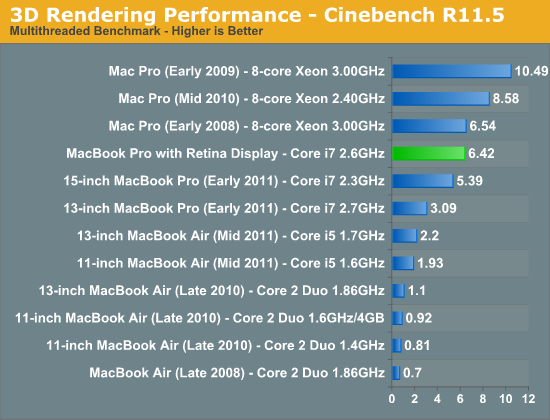 That benchmark is for showcasing raw (and parallel) CPU power, there is no 3D graphics or GPU involved despite the name. Looking at your chart, in order to be faster than the MacBook Pro, you need the 8 or 12 core models of the latest Mac Pro release. Now have you looked at the price of 8/12 core Mac Pro? Have you noticed the amount of other hardware you need? There are multiple factors to the Mac Pro being faster, but it's twice if not three times as expensive as a MacBook Pro. Most professional software including Cinema 4D can utilize distributed rendering these days. If you really need the power of a Mac Pro, get two or three smaller Macs at the same cost. For the 90% of the other times you don't need the massive processing power in the Mac Pro, you have a very portable and rather powerful computer to get your work done. Thus, in my opinion, the current MacBook Pro is a viable replacement for the Mac Pro. (Also my 2009 Mac Pro is not twice as fast as my MacBook Pro… maybe 10-20% at best); the only advantage of my Mac Pro is the amount of RAM I can use. But in many of those workloads, you're better off sending them to a cluster of machines (even better, cheap PC servers) for processing. Yes, sure, there are edge cases where nothing other than a mac pro will do. But they're becoming less and less common. But for the people who need the Pro, it's not a replacment. You can't stick 4 x 3.5" SATA drives in an iMac or rMBP. You don't have dual optical drives. You can't put 128GB of RAM in either of those. You can't get 6, 8 or 12 CPU cores. Sure you can spend tens of thousands on a small cluster but we're talking about a desktop PC here. Not a noisy, hot room full of servers that would make your power bill go crazy. Tis what I already said.... just that those use cases are very uncommon and getting less so. And I'm betting a cluster of quad core Mac minis would likely provide more compute (i.e., CPU) power than a single mac pro at a cheaper price, if your app can support grid computing as provided by OS X server. But yes, if you need it in a single machine (you're dealing with a single large data set that can't be broken up), there's not an alternative. According to my personal experience, latest Macbook Pro is much faster than latest, yet outdated, Mac Pro. Despite there were some optimistic rumors recently, the market segment of Mac Pro is almost captured by MBP. Even if Mac Pro gets this long-awaited update, it is simply too late.